This week’s flavor I mean Metahuman was the shape-shifter known as Everyman, who can not only copy someone’s looks by touch, but also seemingly gain a portion of their abilities as well. After causing quite a bit of drama and trying to use the people in Barry’s life as shields – in a sense – Hannibal Bates was finally locked up in the Pipeline only to realize he’s forgotten what he ever looked like originally; but is he the only one. The notions of chasing a shape-shifter and someone who has cells that can be manipulated into “programmable matter” are actually all too familiar when we remember that this also rings true for Eobard Thawne – who has been masquerading as Harrison Wells that’s to a similar invention. The way Barry traces Hannibal is the same way he and Joe have been tracking Wells. Though like Bates and his unintended ability to absorb more than just looks, the questions is raised whether or not Thawne absorbed more than just Well’s looks. Did he absorb Well’s brilliance as well? What about his love of Tess? In the end, Thawne’s fate might not be too different from that of Bates. He too might realize one day that he’s forgotten what he used to be like, completely consumed in the amalgam being he is now. When it comes to crossovers, The Flash always does it right, and this one was no different. First off, let’s take a moment to acknowledge how AWESOME Katie Cassidy (Laurel) was in her scenes with Cisco. This is a Laurel/Black Canary we haven’t seen in a while. Fun, flirty, confident, this Laurel is what we’ve wanted from the Black Canary since day one. Though it’s not just her swagger she’s got down, but now her patented Canary Cry too. Having Cisco work on this didn’t only give him a helping hand in another superhero’s superheroing; but also made great use of a previous Flash episode. After dealing with the Pied Piper, Cisco is all too familiar with sound tech and those are the skills he uses to create Laurel her new weapon. We’ve yet to see it in action, but it appears to be a necklace of sorts, which should really drive home the Canary Cry into what we’re used to from the comics and animated series. Beyond all the Canary upgrades in attitude and gear, there was one more improvement moment – the relationship between Laurel and her father. Ok, maybe we didn’t see that relationship improve in this episode; but the ground work was laid by Joe, who represents the perfect juxtaposition to Quentin Lance. Both are single fathers with – now – one daughter; but while Quentin is upset at his daughter to lying to him, Joe is lying to his. It’s Joe’s role that will slowly remind Quentin that no matter what his love for his daughter will conquer all, and that maybe – just maybe – lying to your loved ones sometimes is for their own good. When we’ll see this start to play out in Arrow remains to be see, but much like it’s first crossover with Arrow, this episode of The Flash helped to restore some levity to a situation in Arrow. As far as The Flash is concerned, this episode happened the very next morning after “all Star Team Up”. It’s when you pair it with the events of Arrow that we find ourselves back in trouble. As we discussed last week, the “Broken Arrow” episode of Arrow basically broke the Arrow/Flash Timeline Continuity. So there’s no sense in trying to place this with relation to that episode. Instead, let’s just hit the basics. The episode of The Flash takes place after the current events on Arrow for 2 reasons. For starters, the Police Department seems relatively calm and there is no hustle to catch ‘The Arrow”. Additionally, we know it takes place post these events because Laurel has now obtained her trademark ‘Canary Cry’. This device would have come in incredibly handy during her, Arrow and Arsenal’s escape from the police in “Public Enemies” so that fact that it didn’t appear shows that it wasn’t involved yet. Also, the Laurel we see her is much more confident in her own abilities thanks to her training with Nyssa and she’s now started exploring more of Sarah’s old Canary tech on her own. The bump in the road that was Arrow’s “Broken Arrow” might never be fixed, but if we move past that hopefully everything will sync back up nicely. 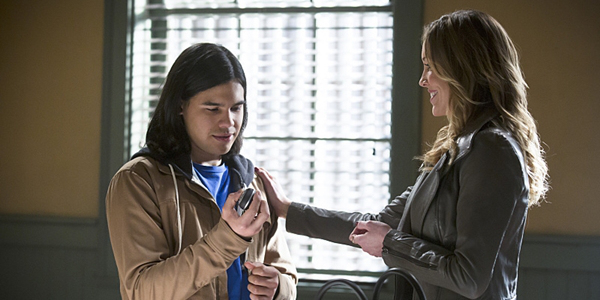 Cisco asks Caitlin to cover for him while he investigates Wells… why does that sound so familiar? Thankfully this one didn’t end with Wells plunging a hand through Cisco’s chest. Anyone else notice how Barry held back when Everyman took on the form of Caitlin and Iris – as you’d imagine – but went completely beat the hell out of Everyman-Eddie lol Wonder how long he’s been holding that one in. Eddie has now admitted to Iris that he’s working with the Flash, but thankfully kept the ‘Barry is the Flash’ part still a secret. HOW does Wells know that Joe went to Starling? From tracing Tachyon Particles – remnants of Time Travel – to find the real Doctor Well’s body outside of Starling City to discovering Well’s secret alcove in STAR Labs, this episode was all about discovering the truth about Doctor Wells. Though some people took this news harder than others. We’ve seen in past episode how Caitlin has dedicated her life to STAR Labs and even turned down Ronnie to stay with STAR Labs. So learning that Doctor Wells is actually a villain would make everything she’s been through mean nothing. Though once the truth has been revealed, there’s no turning back as they discover more than they ever could have dreamed – or feared. Besides finding the Reverse Flash suit, they also discover a news clipping from the April 25th 2024 that reminds us that in the future ‘the Flash vanishes during a crisis’. Just as Joe said to Quentin, anyone who knows isn’t safe; and with Wells half inviting Joe to drinks/half seeming to threaten his daughter, no one is safe. There’s no denying that next episode will bring massive confrontations. 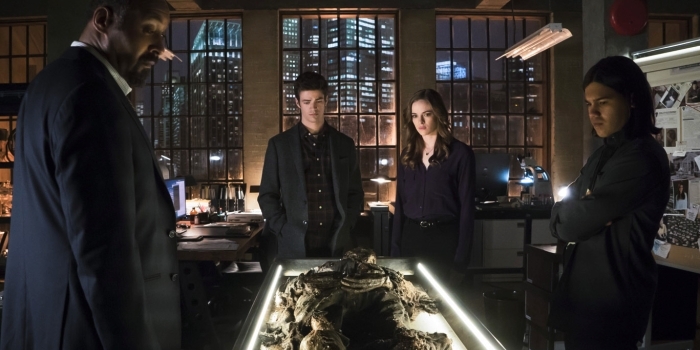 With the truth finally out, the final leg of The Flash’s first season begins.